Looking for the coolest houses in the world? See odd homes that are truly one of a kind masterpieces with the definitive top 12 cool houses list. 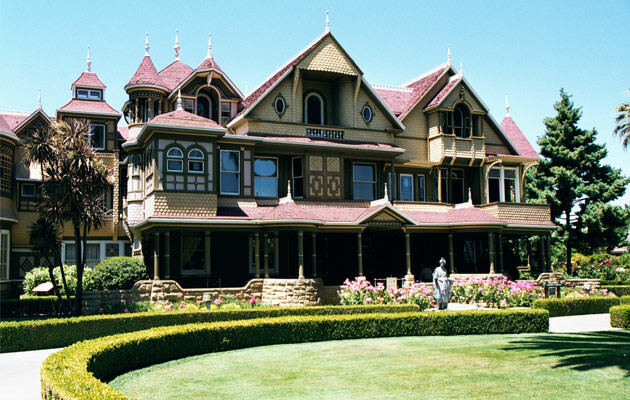 Complete with a spooky history and a most unusual interior design, the Winchester House is a popular tourist attraction today that sits just outside of San Jose. Yes, when we say Winchester, we mean a relation to those Winchesters of the gun company. The quest to construct this home began after the untimely passing of Sarah Winchester’s daughter and husband and after a medium in Boston told the grieving widow that spirits were haunting her family. Native American and Civil War soldiers – those killed by Winchester rifles – were the supposed culprit, and they could only be appeased by the construction of a great home in their honor and memory. Convinced that her life was in danger, she indeed move across the country in 1884 and began ‘communing’ with the spirits nightly to receive their guidance in the construction of the abode. Although purported to also be haunted by spirits, the home was also haunted by bad planning and design. More than 500 rooms were originally laid out, but the floor plans were altered, often suddenly, down to just 160 rooms. This left behind some rather strange interior effects like stairways and doors that lead to nowhere, chimneys that don’t even reach the roof, and steps that lead straight to the ceiling. No doubt, Mrs. Winchester was a bit eccentric, and used a Ouija board to receive messages from beyond while refusing to sleep in the same room two nights in a row. However, her legacy goes on with daily tours of the incredibly interesting and very cool home.